After moving into our new home, I have slowly started decorating. Up until this point in my life, most of the furniture I have owned has been hand-me-downs and I have been excited to add some staple pieces to my home that are within my budget. I started in the kitchen, since that is where my family tends to spend most of our time. I picked out my kitchen table and chairs and while I loved the way they looked in my kitchen, I really felt like I needed to do something more that would define the space of my dining room. I knew that a rug would do the trick, but with three kids, I was nervous that I would constantly be cleaning up after them and that they would stain and spill on my rug. 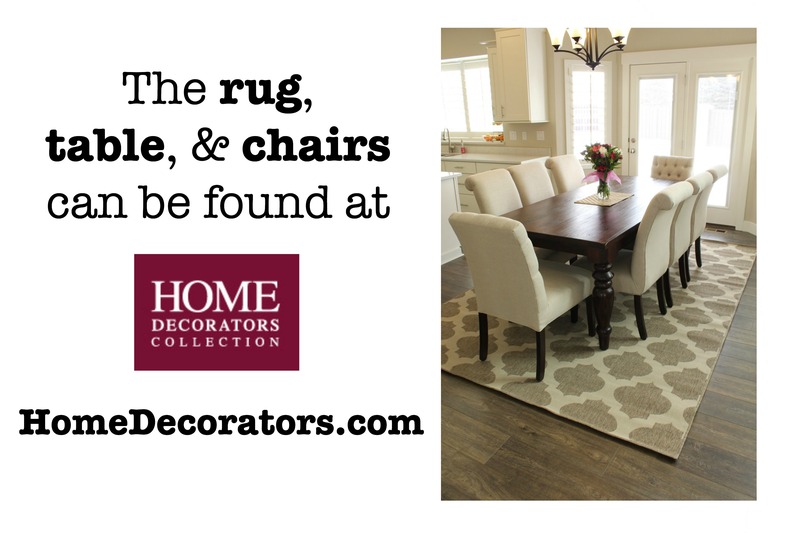 Tip #1: Indoor/Outdoor rugs are the perfect dining room rugs! They are seriously made to handle the elements (which a 3 year old could definitely be compared to a hurricane or torrential rain storm! ), so cleaning up spilled milk or other food is a breeze! So far, everything has wiped right off with some warm water and I love how durable the indoor/outdoor rugs are. As I was choosing which rug to get, I started looking at sizes and realized I had no idea what rug I needed. I knew the size of my table and emailed the company asking what size they would recommend and they responded with this sweet tip, which I wanted to share with you today because it was so genius! Home Decorators Collection is an online furniture company owned by Home Depot and a couple of the sisters have ordered furniture from them before, so I knew their stuff was great quality for an affordable price. They have an amazing selection online, with many of the items having free shipping! This post was written in partnership with Home Decorators Collection, but all opinions and experiences are 100% honest and completely my own. Thank you for the tips on how to measure out the rug. I have been trying to figure out what to do for a while because I want a rug that is going to be proportional to the table and not get caught by the chairs when moved out. I have that problem right now with an older rug and it causes discomfort when sitting at the table. Thank you for the tips! Especially about using am outdoor rug. That's such a great idea! I'm wondering how the upholstery on the chairs is holding up to dirty fingers? It all looks great! What size did you end up going with? And if your table had leaves would you buy the rug based on no leaves in or all leaves in? I ended up getting the 7'6"x10'9" rug and it has worked perfectly. I would get the size rug that fits the size table that you have out most of the time. If your leaves are in all the time, I would base the rug size on that. If you only use your leaves for very special occasions, I think that I would go with a rug that fits the table when it's smaller, just so that it doesn't look like the wrong sized rug the rest of the time! I think that it also depends on the size of your leaves and how many you have too. I hope that helps!! :) Thanks so much for the question! Hi! What color did you go with for the chairs? Thanks! I got the Linen Duck Natural. :) I hope that helps! Hi Camille. I'm considering the table and chairs that you have here. Are they easy to clean? We have kiddos that don't like to use napkins. Hi Lyn! So, my kids are very much the same way. :) I have recently sprayed some Scotchgard on the chairs and have been able to get off every stain with just some hot water and a towel. I am super impressed with how durable the chairs are! I hope that helps! We just got hard wood floors in our dining room and living room (adjoining rooms). So do you get a rug for the dining room table to fit when all of the leaves are in place or for the size of the table during everyday use?? Thanks so much!! You would want to get the rug to fit the table the size it is the majority of the time. Hope this helps. 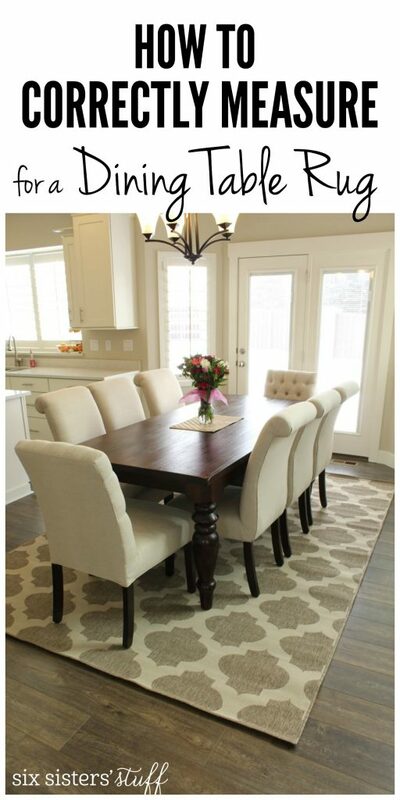 Six Sisters' Stuff...I found this post to be very useful about how to correctly select a carpet for your dining room space. I linked this post to my blog this week about dining room styling must do's: http://forevercreate.ca/home-inspirations/7-dining-room-decorating-must-dos/. Thanks for the tip. What size dining table do you have? Also, what type of floors do you have? I like how easily your chairs slid over the floors. They looked like luxury vinyl tile, which is what I was thinking of getting and just want to make sure it's ok to put a rug on them without any issues. Thank you for your response Camille! It's so helpful. Can you give me the name of wall paint on the walls? Do you know where I can get that table from? I love this set but I am in the camp with all of you who have littles who are very likely to stain the chairs. Now that you have had them for awhile, can you tell me what types of stains you have been able to wipe off? Are they from the big offenders group? I am mostly worried about things like spaghetti sauce and greasy pizza? Will we have to eliminate these things from our diet if we purchase these chairs? Thanks so much for bringing this set to our attention. It is beautiful!